If you need superior sound quality for small club gigs, churches or speeches, but have to keep the outboard gear to a minimum, get ready to love the PMP980S and PMP960M. The 900-Watt, 10-channel/6-channel mixers give you everything you need in one efficient, highly portable little package. The PMP980S and PMP960M give you loads of flexibility in accommodating whatever the center of attention happens to be. Channels 1-6 of both mixers are for mics, bass guitars or other mono instruments. 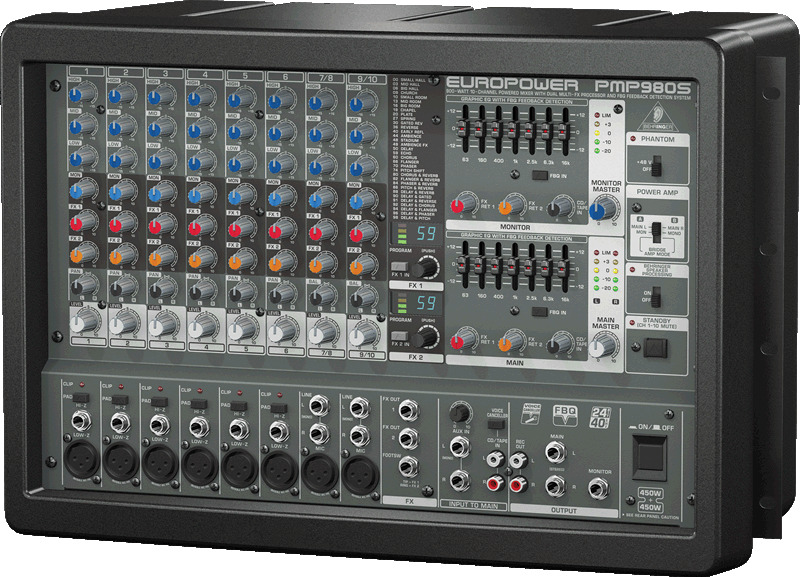 The PMP980S features channels 7-8 and 9-10, which can be used as stereo channels. 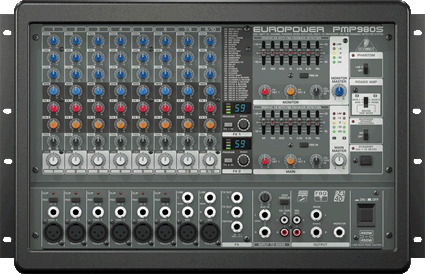 In the case of the PMP980S, that means you can connect up to 8 microphones or other mono instruments or six mics or mono instruments along with two stereo instruments (keyboards, for example) or the A/V equivalent. In the bottom right corner of the mixer, you�ll find the FX, INPUT TO MAIN and OUTPUT sections. The FX section features a FOOTSW(itch) input. This lets you connect a footswitch like the AB200 so you can remotely enable/disable either FX channel. FX OUT 1 & 2 are used to connect up to two outboard effects processors. The AUX IN 1/4" inputs in the INPUT TO MAIN section allow you to route an external stereo signal to the main mix. The AUX IN control adjusts the volume of the external signal in the main mix. Use the 2TR IN RCA inputs to feed in external stereo signals from CD players or tape decks. The VOICE CANCELLER switch allows you to eliminate the vocals from pre-recorded music for karaoke applications. In the OUTPUT section, the REC OUT RCA outputs send line-level signals from the mixer to a recording device, so you can finally get to work on that triple-live album you�ve always dreamed of. The MAIN 1/4" connectors are there just in case you want to connect more amps. Connect your monitor power amps or active monitor speakers to the MONITOR output. 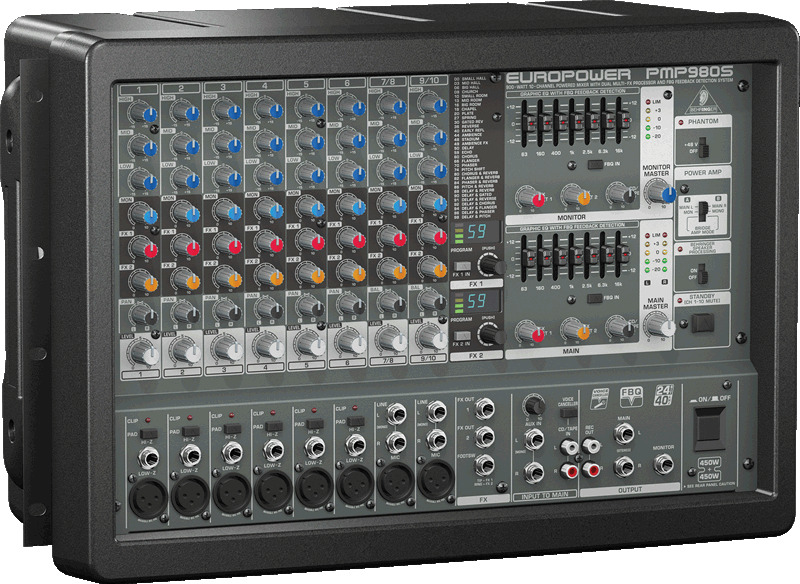 You�ll be operating this mixer like it�s second nature thanks to its simple, intuitive layout. Each channel has a three-band EQ (HIGH, MID, LOW) blue; MON(itor) level in gray; FX1 in red; FX2 in orange (PMP980S only); PAN in black (only PMP980S); LEVEL in white. There�s also a switchable PAD and CLIP LED per channel. Once you�ve set the levels on individual channels, it�s easy to create your MAIN and MONITOR mixers. The MAIN and MONITOR sections are nearly identical, featuring graphic 7-band EQs that allow you to adjust the sound to the room acoustics. This is where the FBQ feature comes in particularly handy. Press the FBQ IN switch to activate the Feedback Detection System. Trouble frequencies are indicated by brightly lit fader LEDs. Just lower the level of the respective frequency range until feedback disappears and the LED goes out. The FX RET controls add the selected effect signal to the main or monitor mix. When both are completely counterclockwise, no effect is applied. The 2TR IN control adjusts the volume of the 2 Track signal, if you have connected one. Use the MAIN MASTER/MONITOR MASTER controls to adjust the main and monitor output signals, respectively. The 5-digit LED meters give you a visual representation of these volumes. The upper LIM LED illuminates when output levels are too high, activating the internal amp protection circuit. 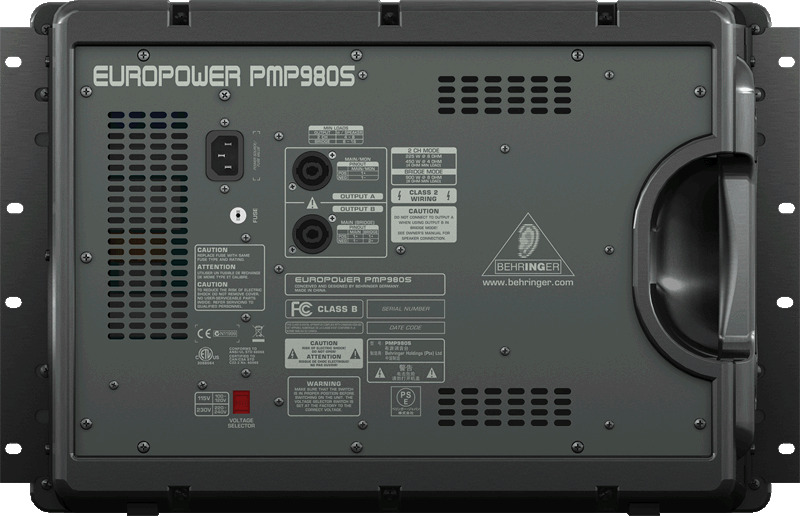 PMP980S�s POWER AMP switch toggles between three operating modes: STEREO, MON/MONO and BRIDGE (the power outputs of A and B on the back panel are added and provided at OUTPUT B). The PMP960M provides similar options: Bridge mono or dual mono (Output A can be used for mono Mains and Output B for Monitor Send 1, or Outputs A and B can be used as Main/Main). This clever functionality enables you to power both your mains and monitors without the need for an additional power amp just for your monitors. Directly below, you�ll find the SPEAKER PROCESSING switch that activates a filter in both models, adapting the mixer to the frequency response of your loudspeakers. Finally, the STANDBY switch lets you mute all input channels during breaks, preventing the microphones from picking up noise or interference. You can leave all faders untouched while you play a CD via the CD/TAPE inputs. Small, simple events call for a lightweight, simple powered mixer, and these are the most efficient, aff ordable mixers for the job. They�re easy to learn, easy to operate, and with so many incredible built-in features, they make it easy to put on a show in an instant. Speaker Processing function adjusts frequency response to match professional speaker systems like BEHRINGER EUROLIVE series, etc.